In 1782, the Second Continental Congress declared the bald eagle the National Emblem of the United States. 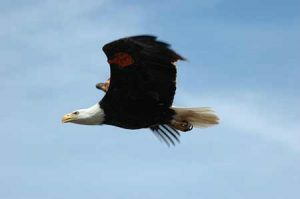 As the national bird and the mascot of the USA, the bald eagle is easily the most iconic and identifiable bird around. After a severe population decline, the eagle became protected under the Bald and Golden Eagle Protection Act of 1940. Since then, bald eagles have thrived in their native habitat of North America - especially in Montana and the Greater Yellowstone . In 2007, the bald eagle was removed from the federal list of Threatened and Endangered Species in the Lower 48. Today, bald eagles are a common sight in Big Sky Country and across the Treasure State. Bald eagles live in Montana all year long, but the best time to spot one is during the Fall. As bald eagles migrate south from Alaska and Canada in search of food and warmer temps, the Montana population increases. Keep your eye peeled in forested areas near rivers and lakes and you'll likely spot a bald eagle or two. The scientific name for a bald eagle is Haliaeetus leucocephalus. Bald eagles only live in North America. Montana is home to over 500 active bald eagle territories. Their white heads and tails, dark brown bodies, and yellow bill are unmistakeable. Eagles do not develop their identifiable plumage until about 5 years of age. They are the 2nd largest bird of prey in North America - only the California Condor is bigger. Bald eagles measure approximately 3 feet head to tail. Their wingspan ranges from 6 to 8 feet across. Females are generally 25% larger than males. They weigh 9 to 14 pounds, but their skeleton only weighs about half a pound. Bald eagles have approximately 7000 feathers. Bald eagles can fly at 35 to 44 MPH, but can swoop at 100 MPH down to catch food. They can soar for hours at a time and reach heights of 10,000 feet. Bald eagles tend to make chirps and whistles. These birds live an average of 28 years, but the Smithsonian says they can live up to 50 years! Bald eagles are carnivores that eat salmonids, suckers, whitefish, carrion, and small mammals and birds. They tend to live in forested areas along rivers and lakes. Bald eagle nests are called aeries. Aeries are typically built in the oldest, largest diameter trees of the forest - usually in ponderosa pine, douglas fir, and cottonwood trees. Aeries are built out of branches and sticks and then lined with grass, plants, and pine needles. They are often used for multiple years. Nest can be up to 12 feet high, 8 feet across, and weigh up to 2000 pounds. 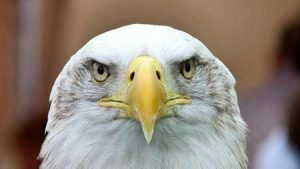 Bald eagles breed at 5 to 6 years of age. Females lay 1 to 3 eggs in March or April. The eggs are incubated by both male and female for roughly 5 weeks. Baby eagles are called eaglets. They attempt their first flight at 10 to 12 weeks. There's something special about spotting a bald eagle in the wild. 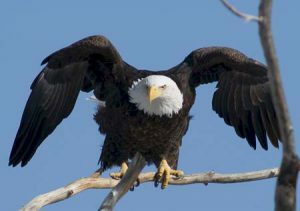 As the symbol of the United States, it's fun to spot these iconic and powerful birds soaring overhead while in Yellowstone National Park or swooping down on your favorite lake while you're fly fishing. If you capture a cool wildlife photo of a bald eagle when you're in Big Sky Country or in Yellowstone National Park be sure to share it on social media with #visitbigsky.